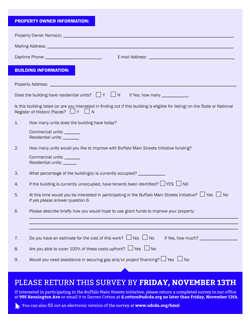 Click on the image to download a full-sized PDF of the survey. You can print out a hard copy and return to our offices at 995 Kensington Avenue. The University District Community Development Association (UDCDA) was recently awarded a Technical Assistance grant through the Better Buffalo Fund. This capacity building grant will assist the UDCDA in working with the Bailey Avenue Business Association and local property owners along Bailey Avenue to apply for building renovation grants through the Buffalo Main Streets Initiative (BMSI). The Buffalo Main Streets Initiative provides funding for renovations including: façade renovations; interior commercial and residential building upgrades and streetscape enhancements. The BMSI is a reimbursement program, meaning all project costs must be paid upfront by the property owner. After the renovation project has been completed to the outlined specifications and after supplying appropriate receipts and proof of payment property owners will be reimbursed for 75% of project costs by the state. Applicants to the BMSI are asked to focus on a 3-5 block stretch of the commercial corridor, so part of the planning process will be selecting this target area. If UDCDA does have a successful Main Street grant application monies would not become available to property owners for at least 18 months to 2 years. Therefore, any property improvement projects identified for your property would need to be long range planned improvements NOT immediate needed property repairs or improvements. Are you a property owner along Bailey Avenue who is interested in participating in the Buffalo Main Streets Initiative?